Morning coffee from the front porch looking out to the road. Bunk room sleeps 4 with double bed on bottom bunk. Guest bedroom with memory foam queen mattress. Roomy side yard, perfect for a croquet game. Privacy abounds for your morning coffee on the wraparound deck in this centrally located ranch home, a 1/2 block from the Old South Rd Bike Path and NRTA shuttle stop. The large, open living room with dining area opens to the kitchen with dining bar. Master bedroom with full bath (shower) and Select comfort Cal.king bed. Two other bedrooms share a full bath (tub/shower) located off the hallway. The sizable yard allows for croquet tournaments, horseshoes, cookouts and other outdoor fun for family gatherings. Bikes, outdoor games, cooler and beach/deck chairs available in the basement. Full sized washer/ dryer and pantry are located in the mudroom. Other amenities include cable TV in two rooms, Internet access, BBQ grill, and linens. Parking for 2 cars. Additional availability info: Book early for summer 2020 as we may only be renting “Behind the Hedge” for two weeks. This is a Saturday to Saturday vacation rental. Additional pricing info: Six hours of cleaning service is built into rate. State and local taxes of 11.7% will apply. My three grown children and l just spent a week at Behind the Hedge. The accommodations and descriptions of the home were on the mark! It was excellent value for the price. My children particularly appreciated the bicycles at the home. It was a very lovely touch. Thank you, Cathy and Jim, for trusting us in your home. My girlfriends and I stayed here over a long weekend towards the beginning of the summer and could not have been happier with Cathy and the house. Cathy was extremely accommodating and set us up for a great weekend with her recommendations and rental guide. The house is open and spacious. We were all able to sleep comfortably. It is in a great location just around the corner from a bus that can take you into town. I had the pleasure of staying at this home last summer. It was ideal - and Cathy and Jim couldn't have been nicer! The home itself is cozy and bright with lots of outdoor space. We wanted for nothing - there were bikes, beach chairs, a barbeque, beach towels, etc. And the location is perfect - close to the airport but the island is so small that you are in town or a beach within minutes! I highly recommend staying here! Great location for all that the island has to offer. We enjoyed bike riding and the extra bikes came in handy. WE dined in the house and the grill was great. ....your yard was perfect and I hope to see the hydrangeas bloom next time. ...the street is quiet, the yard is perfect for our dog and stargazing on a clear night and the beds are super comfortable. You are located in a spot that has such easy access to all the beauty this island has to offer! We loved every minute of our time here and hope to come back next year! 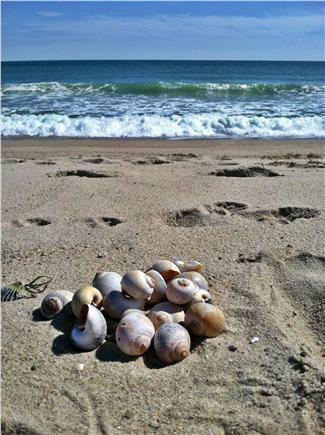 Being our first trip to Nantucket, Cathy was the perfect homeowner to rent from for the experience. With years of time spent on the island, she was so helpful and generous with knowledge of Nantucket, giving us practical tips as well as some great "must-sees" and "must-dos" that we most likely would not have found on our first trip to Nantucket. My husband,14-year-old-son and his friend, and I, spent a glorious week in this charming cottage. 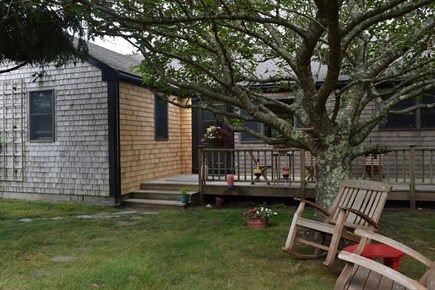 Even though Nantucket isn't a large island, this home seems to be near everything! 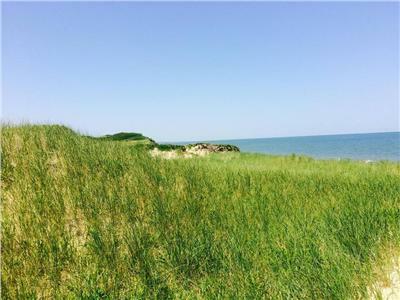 Close enough to drive or bike to a wonderful beach, close to the airport, close to restaurants...but far enough out of town so that the hustle and bustle of "downtown" isn't invasive. Yet if downtown is a destination, it only take a few minuted to get there. The house had everything we needed for our week, and Cathy and Jim gave us great ideas of things to do and places to go. The beds are comfortable, the decor is timeless, the yard is very large, and the porch spans the front of the house...what more could we ask for? 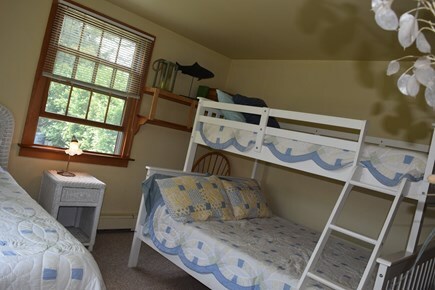 The boys especially loved "their" bedroom with the bunkbed in it. I can't wait to go back! My husband and I and our two children, ages ten and 13, absolutely loved our stay at this cozy house and enjoyed Nantucket thoroughly! We loved biking everyday and we are not bikers. The paths were everywhere, safe from the traffic, and flat enough for the whole family to navigate for hours. The bike rental was in walking distance, and they collect your bike for you, if desired. The town offered so much in the way of live music, great food, and the beautiful scenery of a cozy wharf. I had never been anywhere that had such beautiful homes that mixed into the landscape, making nature and architecture seamlessly blend. The overall effect, just so peaceful. There were public tennis courts nearby, ballparks, golf courses and beaches all in walking distance. The back yard is so spacious and flat we were able to play sports right outside our door. Everything was so nearby, we could quickly head to a restaurant or cook at home with ease. The house offered everything we needed. I have rented homes before where we had so many things to secure before feeling settled. Everything was easy, accessible and cozy. We stepped off the plane, and arrived ten minutes later! The whale museum was amazing! Jim and I are retired school teachers. I spent many a summer on Nantucket with my family growing up. My dad was born on the island & never left it until he played for the Whalers football team. As a teacher himself, he provided for us by helping Grandpa build houses out in Madaket during the summer. Needless to say, we ran like gypsies back in the day and learned to love the island as true ''Portugees''. Having a chunk of the island at this stage of life is a dream come true, and sharing it with others is an honor. The house itself is on a lovely little residential street where many islanders live. Both ends connect to bike paths and other walking paths in the moors. I love the fact that we are away from the summer hustle and bustle and non stop traffic in town. We can quickly get to the beach by car or bike. The house is laid out for family togetherness, and for Nantucket, the yard is amazingly large allowing for family fun and games. Let's see-- Dionis sunsets, crabbing at the bridge, a boat or car ride out to Great Point, Saturday yard sales, the unending dunes, pure beach with no high rises anywhere, just charm, hanging at Brant Point and watching ferries and other boats head out or come in, a morning run out to the Madaket Mall, a Sconset afternoon bike ride, Summer St Church, any number of town events (art shows, plays, concerts), no chain stores, no neon, just grey shingles--- that's just part of what I call Nantucket mag''ACK''. Time slows down! Peace & serenity awaits you.